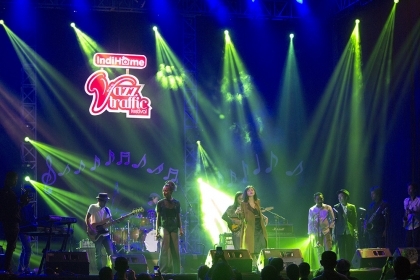 IndiHome Jazz Traffic Festival 2018 which brought title The Future is Now, has been successful and very lively held on August 25-26 2018 by presenting a variety of music artists across generations and various types of music. Elements of Jazz, Pop, Rock, Folk, and Dangdut music, combin and blended at Jazz Traffic Festival which is one of the biggest jazz music performances in Indonesia. In eight year of this event there are more than 400 musicians, 54 performances which are divided into five stages, Indihome, MLD Spot, Kolaborasik, Surabaya Sound stage, Jazz Traffic. From First Day, at Suara Surabaya's Grand City Convex Surabaya Stage Exhibition Hall, Sheryl Sheinafia was perform and bring the warmth of the Jazz Traffic atmosphere. At another Stage, performance of GAC have attracted attention from audience. Enter the evening, crowd filled all of the JTF location. They spread, fulfilling five stages provided. Gilang Ramadan Blue duo and Eet Sjahranie Black performance which their original music is rock, calling the crowds up with ferocious composition they called Loud Jazz. Many musicians also appeared dedicated to Lombok Earthquake victims. Dwiki Dharmawan Jazz Collective who appeared collaborating with Trisouls became one of the performers who empathized for them. After the show of Fusion Stuff, Passatu, 3Device and HiVi !, Tom Grant, The Father of Smooth Jazz, performed with Shelly Rudolph, the singer called by Tom as Princess of Smooth Jazz. Both sang three songs together. Two of them are quite familiar to classical jazz musicians, One Note Samba, popularized by Antonio Carlos Jobim, and Natural Woman popularized by Aretha Franklin. Not only with Shelly, Tom also invited Luanada Joy of an Indonesian Jazz singer to the stage. Jazz Traffic Stage was again filled with Idang Rasjidi, a veteran jazz musician from the country. Idang Rasjidi plays around six of his own songs, including Red Code, Black Dolphin, Misty, and Soul Bossa. Idang dedicates his performance that night to legendary jazz musicians from the country such as Bubi Chen, Maryono, Jack Lesmana, and his senior jazz musicians. Via Vallen, one new shining singer because of her latest performance singing the 2018 Asian Games theme song, being the top closing on first day. The singer of "Sayang" song, just enjoyed bringing a few compositions which were slightly arranged by Jazz. Jean Pialsa's drum beat was enough to make thousands of spectators who filled Grand City Convex Surabaya courtyard sway together. Around eight thousands of music lovers attended the first day of the 2018 IndiHome Jazz Traffic Festival from first day. On the second day, Sentimental ska band Moods from Jakarta began to spur enthusiasm of music lovers with their instrumental works at Suara Surabaya Stage. In addition, the eight-member indie band also plays songs with vocals. Among others, titled Lhaiki, lyrics are Javanese, and Payung Fantasi by Ismail Marzuki, a homeland composer who gave birth to many works in the early days of Indonesian independence. At IndiHome Stage, JAZ successfully entertained young generation, (especially women) with romantic songs he sang, including titled Shape of You, Happy, You Are, Kala Cinta Menggoda, Happy Friends, Medley Galau, Kasmaran, That`s What, This Is Love, and from the eyes. Yura Yunita, female soloist and the best songwriter of Anugerah Musik Indonesia (AMI) 2017, appeared at Suara Surabaya Stage. Stars and Rabbit's performance at Jazz Traffic Stage also attracted a lot of spectators who mostly like folk songs by Elda Suryani, the vocalist and guitarist Adi Widodo. Elda's enthusiasm and inspiration while singing a song while playing a tambourine, seemed to provide energy for the audience for sing and choir together. Getting into night, the stage of IndiHome Jazz Trafic Festival was even more excited by appearance of Indra Lesmana Surya Sewana featuring Dewa Budjana. Balinese nuances presented spontaneously bring inner peace to music lovers. Then, Rahmania Astrini entertained at Suara Surabaya Stage, and continued with Syaharani and Queen Fireworks. 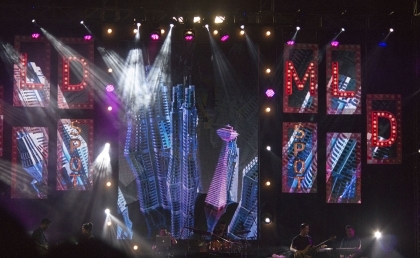 Meanwhile, at MLD Spot Stage, Indra Lesmana with his other project appeared in Indra Lesmana Project band format. The band which was driven by Indra Lesmana in the keyboard position played progressive rock rhythmic music, and managed to amaze the audience. The excitement grew when Tulus appeared on IndiHome Stage. Tulus played a series of his hits, and latest single Labirin. At the same time, Reza Artamevia played a distinctive husky voice in front of the audience at Suara Surabaya Stage. Raisa again made IndiHome Jazz Traffic 2018 viewers rejoice thanks to her melodious voice when singing a series of flagship songs. As usually habit from other Jazz Festival, jam session at the edge of festival held at Jazz Traffic Stage who was took part Indra Lesmana, Idang Rasjidi, Sandy Winarta, Indra Gupta and a range of young musicians gathered in the Jazz Traffic All Star. Playing a number of compositions dedicated to Bubi Chen, the Indonesian pianist maestro. Indra Lesmana presented an instrumental song as an opening. Then, Idang Rasjidi sang a song Bubi Chen, a friend and music mentor who had passed away earlier. Sri Hanuraga contributed her skill in playing the piano by playing a jazz version of the Old Parrot song. Padi Reborn became the closing band at IndiHome Stage Outdoor Grand City Convex Surabaya. Padi performed the 10 best songs from their last album in 2007 and also on their first album Lain Dunia which was released in 1999, like Begitu Indah, Maha Dewi, Sobat. The Padi Reborn song was sung simultaneously by audience in the closing of the IndiHome Jazz Traffic Festival 2018. The audience came home with a smile bringing memory from Jazz Traffic Festival which can be shared as a beautiful story. See you at next Jazz Traffic Festival!